Weirdest thing happened to me yesterday; I pulled into the gas station to fill up, and upon turning the key to open the fuel tank, heard a bunch of air get sucked inside before gasoline SHOT OUT of the tank all over the place. A geyser about 5 feet out of the tank. Thank goodness the bike was angled away from me, though I still got sprayed. Anyway, after washing the bike (and myself), I pulled off the lower fairings and started trying to figure out the problem. As best I can figure it, the tank must have become a vacuum with a clogged vent or something. 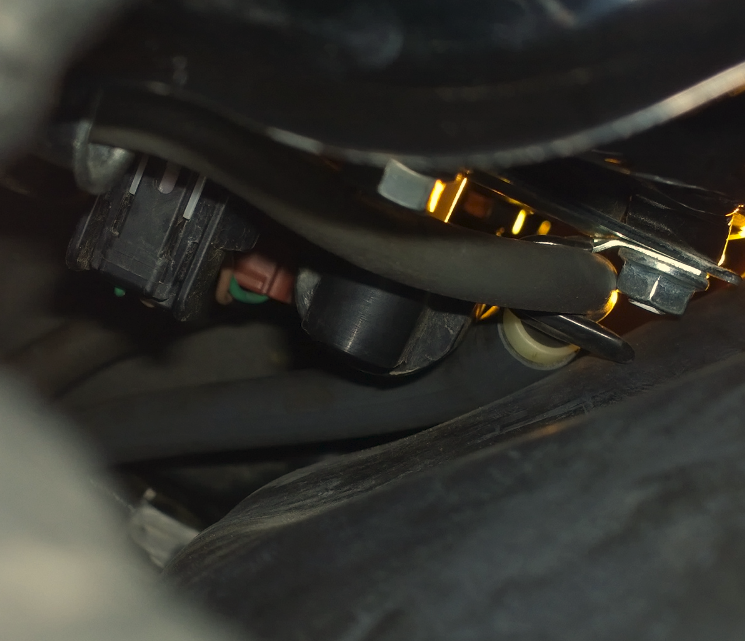 There are 3 black hoses by the shifter: 1 smaller diameter and 2 larger. 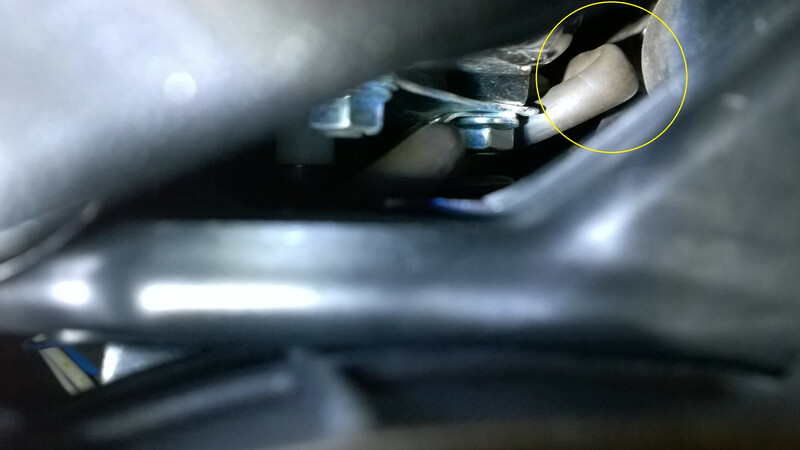 The small diameter hose and one of the larger reach to and extend a little out of a cut-out in the fairing, leading me to believe those are overflow tubes for the coolant and fuel. The third tube (a larger diameter one) just sort of hangs straight down behind the fairing, so I think this is the vent tube. I opened the tank (and heard a suction noise, so problem still present), and put a straw into that tube at the bottom and blew into it, but couldn't. Should I be able to blow air into it? There haven't been any mods or anything since it was acting normally. I'm at a loss as to what might have happened. Anyone got a tip or two for me in troubleshooting this? Here's the breather hose I suspect is the first thing to check. (but I can't possibly see how this got clogged or pinched). 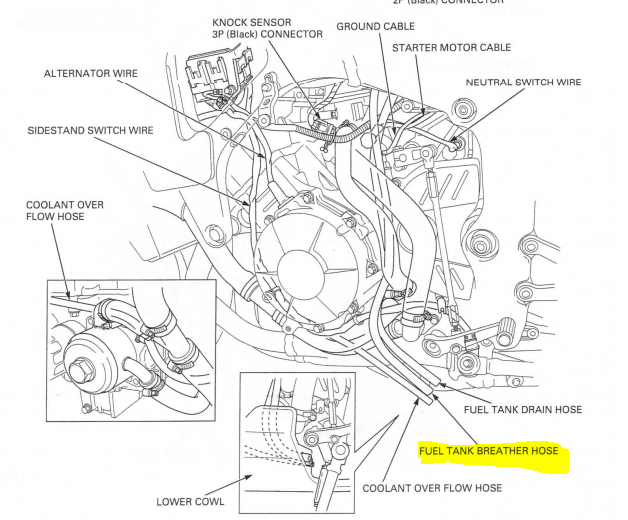 Should air be able to be blown in with the fuel tank cap open? So figured it out; indeed a kink in the breather. I lifted the tank and was then able to blow into the breather hose when the gas cap was open, but then in lowering it, couldn't. Problem solved for the breather hose. Incidentally, the overflow hose is also kinked, and I couldn't do much to change it. Once the hoses get kinked, they are trained into that position so it's very difficult to reposition them. Not sure how I'll address that one.